November is such an interesting month in that it manages to cover so much ground: at the start of the month, we’re just coming off of Halloween. Then we have a few fall-ish weeks leading up to Thanksgiving, and before you know it, the Christmas season has arrived. 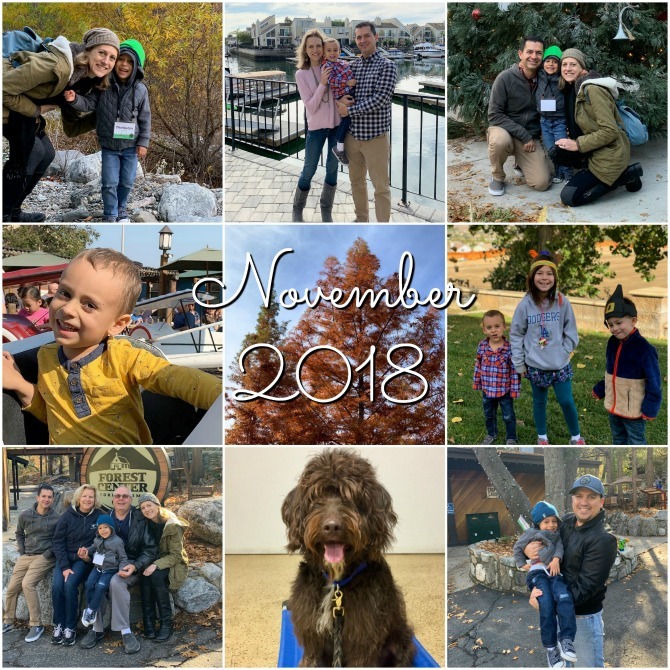 Throw in a ten-day trip to California for our family this month, and it’s no surprise that November flew by before I had a chance to catch my breath! This November, the weather here in Austin reflected the abrupt holiday/seasonal transition: on November 1st, the weather hadn’t fully shifted and our trees were mostly green; now they an array of oranges and yellows—or completely bare—and our grass has settled into hibernation mode. Fall ended before it had a chance to fully enjoy itself. Sitting here on the precipice of December, I’m feeling much the same way, launching into yet another season without having closure around what came before. I’ve been so caught up in the day-to-day that I’m missing the bigger picture of what’s going on around me. Thank goodness for blogging, that helps me to stop and savor the moments—even though it’s done in retrospect. Here’s a look at some of what made this November a memorable one. 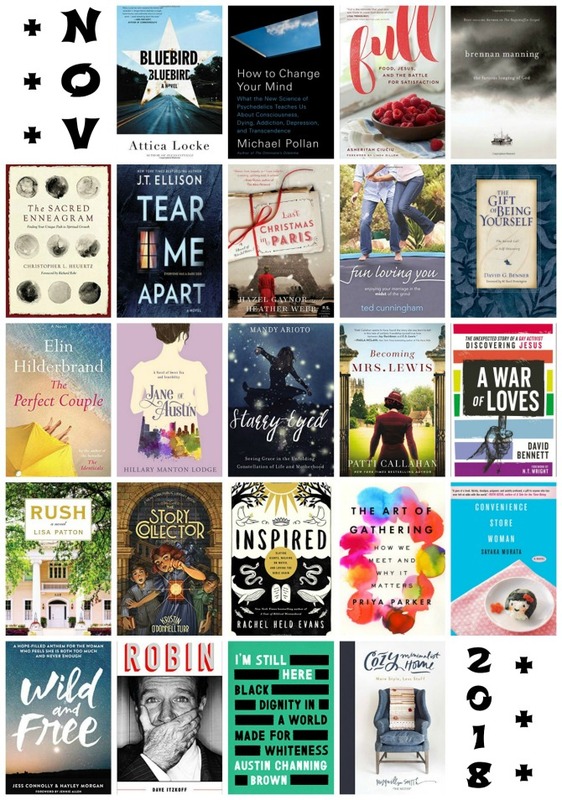 This month I achieved my goal of reading 200 books in 2018! I wasn’t as far ahead of the game as it may seem, as I use November as my cutoff date for documentation purposes. Still, I was proud of myself for reaching this goal (and even going a bit further to read a total of 205 books this year). I have a whole lot of thoughts related to this personal record and what it means for my reading life; I’ll be spilling all the details in my end-of-year reading recap at the end of December. As for the specific books I read this month, there were some really great ones. This book about psychedelics, this one about Bible interpretation, and this book from a celibate gay Christian were the most thought-provoking. I didn’t read many novels, but this epistolary book set during World War 1 was easily my favorite. This Upstairs/Downstairs-style novel about the Greek system was an engaging read that I viewed a little differently having just read Austin Channing Brown’s memoir about racism. The book I’m reading for next month’s Reading Challenge category (a book nominated for an award in 2018) is another novel with heavy racial themes; it was this year’s recipient of the Edgar Award, and I can see why it won (in fact, I can’t believe it hasn’t received more attention). I’ll be sharing full reviews of every one of these books in the next few weeks. There was so much wonderful music in my life this month. Of course, by now I’ve moved onto all of my Christmas favorites, but before Thanksgiving I was listening to J.J. Heller’s latest album on repeat. It’s a collection of familiar classics, performed in a lullaby style, and it is the perfect album for winding down at the end of the day. I’ve enjoyed Heller’s voice in the past and appreciate her work even more now, after hearing her share her story on The Happy Hour podcast. 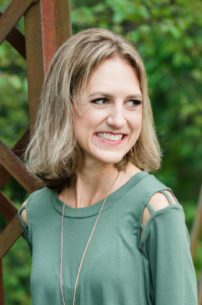 Nichole Nordeman’s Every Mile Mattered made a great companion album, with its beautiful musicality and inspiring lyrics. It’s an older album that I listened to for a while after it came out last year, and just returned to recently after a reader mentioned that this post reminded her of the song “Slow Down”. A third album our whole family is loving is Imagine Dragon’s latest, Origins. It’s great dancing music to start off our days, and it’s hilarious to watch Charleston air-guitar along to the songs, particularly his favorite, which was on repeat for an entire day earlier this month. Between all the music, I made some great podcast discoveries this month, and the first happens to be music-related. I’ve been hearing all about this latest project from composer Ryan O’Neil, who just finished the seventh of nine songs dedicated to each number of the Enneagram. The songs are musically gorgeous, and his podcast has helped me appreciate them for the incredible masterpieces they are. Each song incorporates lyrics and musical styles that embody the title number’s personality traits. O’Neil has been working with Enneagram expert Christopher Hueretz to fully tap into each number, and he invites individuals who identify with each number to contribute as artists in each song. The resulting pieces are some of the most thoughtful, creative, eye-opening songs I’ve ever heard and I’ve loved hearing all the behind-the-scenes details for each one on the podcast. I rarely listen to investigative journalism-style podcasts, but I binged two of them this month. 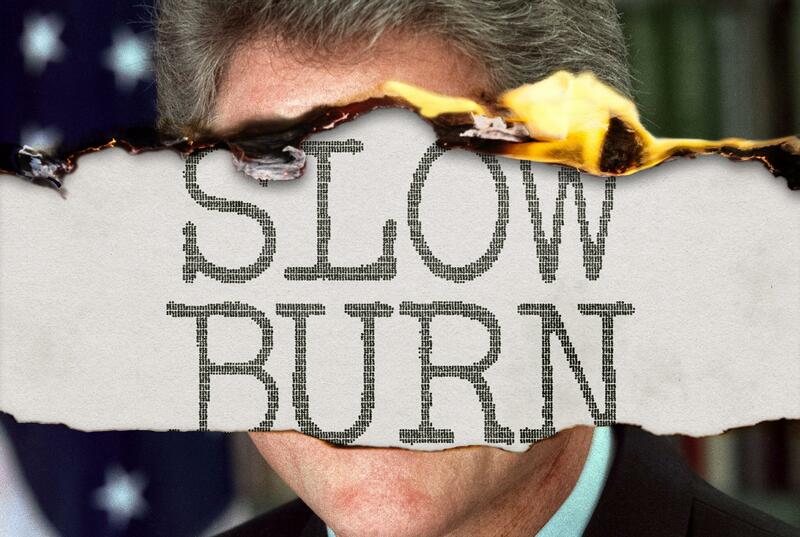 The first was Slow Burn; I still haven’t checked out Season 1 (which was about the Watergate Scandal), but the second season focuses on the Bill Clinton Impeachment and I found it fascinating. I was a young teen when the scandal occurred and didn’t follow it closely, so much of the information was totally new to me. It was interesting to view those events through the lens of the current #MeToo movement. I came away from the podcast with conflicting thoughts and more questions than answers, but it was certainly a compelling listen and one I’d like to discuss with others. 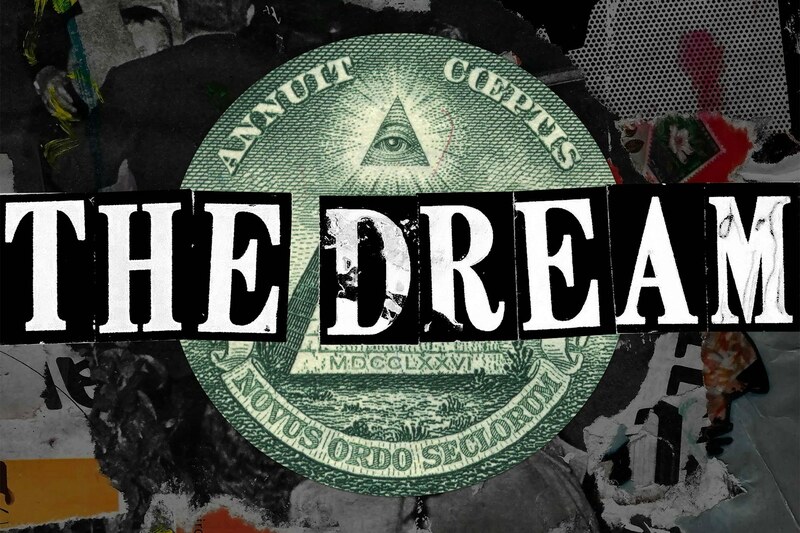 My third podcast binge this month was The Dream, a podcast exploring the history and current prevalence of MLM’s. Luke and I were the “victims” of an Amway recruitment a few years ago (though we were several weeks into the process before the word “Amway” was reluctantly given to us), and the experience left me with a very negative impression of MLM’s. The information in this podcast helped me understand why the model/recruitment process didn’t sit right with me: from the emotional manipulation to the reluctance to share specific numbers and details and, most concerning, the cultish vibe of it all. I have friends who have had good luck with their own MLM’s, and the podcast definitely paints them in a harsher light than necessary (I especially struggled with their disparaging remarks on Christians and their connections to MLMs, and I felt the podcast unfairly blamed the Republican party for the continued prevalence of MLM’s), but the show was enlightening and something I wish had been available to me a few years ago. These laughable quips are a mere glimpse at the joy and hilariousness that is my son these days. To say that I’m obsessed would be an understatement. I just never know what will come out of his mouth next, and it’s amazing! We’ve been meaning to train Arlo and just haven’t made the time to do it until this month. With the holidays coming up, we knew it wasn’t likely to happen until next year so we decided to have him trained professionally while we were out of town. We dropped him off at “Boot Camp” prior to our vacation, and he will be staying there until next Tuesday for a total of three weeks. 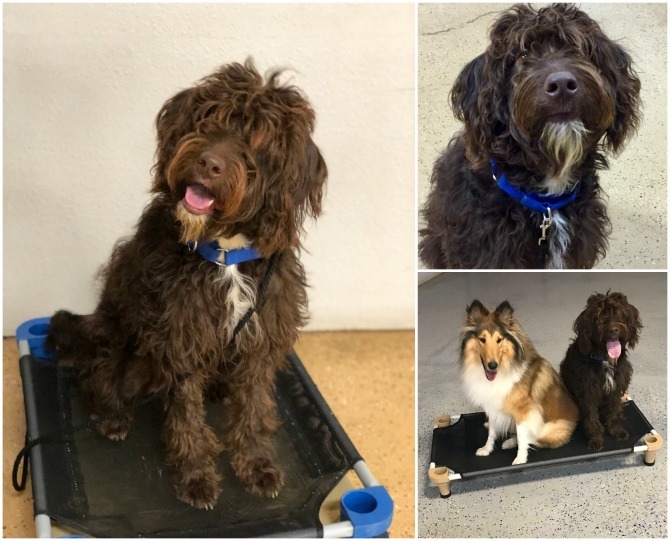 He isn’t home yet, so we don’t know how successful the full-immersion training has been, but his trainers actively post on Twitter and we’ve loved getting daily updates and snapshots of our pup. I’m guessing the training has been effective, because I never got him to sit so still for photos! Our house is so quiet without him, and while I don’t miss the extra work or mess, it will be good to have him home. I hadn’t realized what a big part he plays in our lives and routines until he was gone! 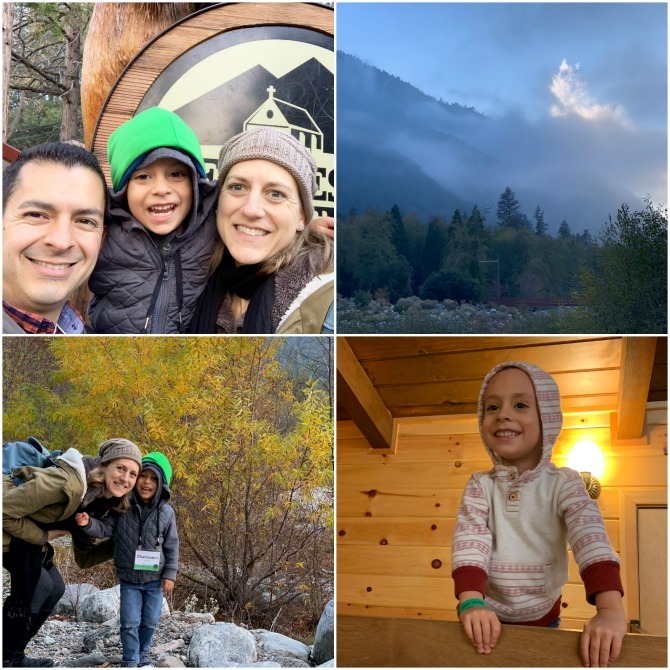 The big highlight of this month was our annual Thanksgiving trip out to California. Our vacation got off to a rocky start, with Luke and I both fighting colds, and my feeling down about some personal sad news. We also discovered that Charleston has entered the “are we there yet?” stage which makes the 22-hour drive seem even longer. Despite these setbacks, we survived our journey to Huntington Beach and it was well worth it! This trip was all about spending quality time with my parents and brother. 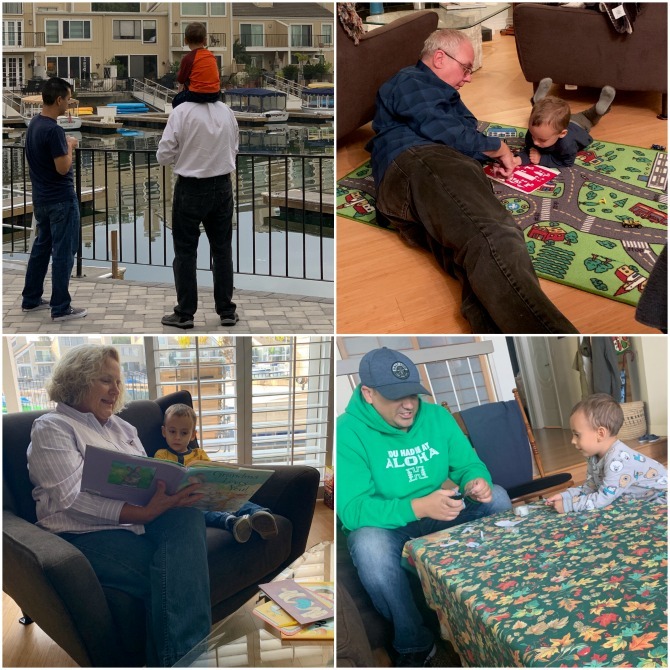 There were many relaxed mornings and evenings sitting around my parents’ living room, designing paper mazes and reading books and playing cars on the city rug they bought Charleston. Now that Charleston is older, he was better at entertaining himself while we adults had some great conversation. 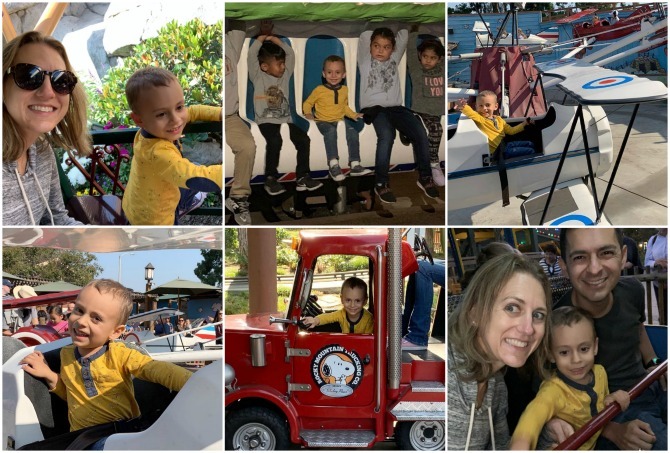 We surprisingly made only one trip to the neighborhood playground during our stay, but we did get outside for a nighttime Duffy boat around Huntington Harbor, checking out Christmas lights. 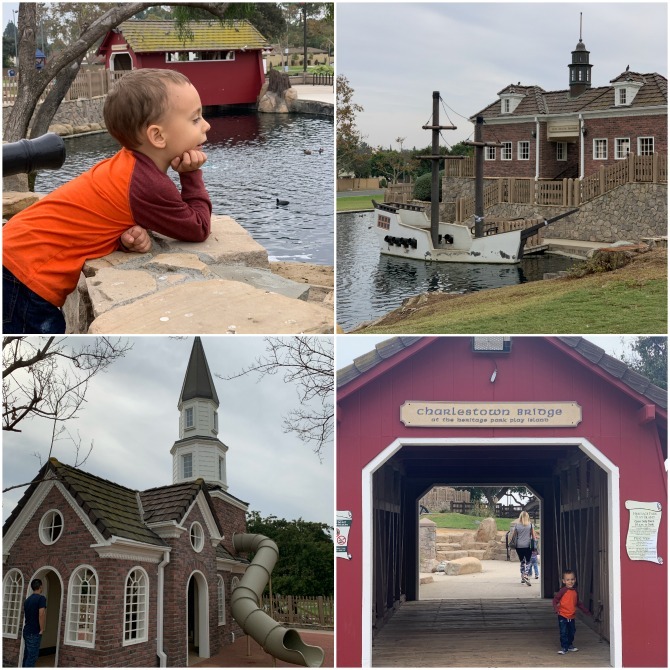 My mom took us to Heritage Park, a beautiful spot with a lake, several playscapes, and a unique island with a playground built into structures that were designed to look like colonial buildings. I’ve never seen anything like it, and was impressed by both the design and cleanliness of the park. Charleston loved playing hide-and-seek in the buildings and chasing after the ducks. We spent one full day at Knott’s Berry Farm. I grew up going there and it was fun to introduce Charleston to this spot—and even more fun this time of year because the park was beautifully decorated for Christmas. 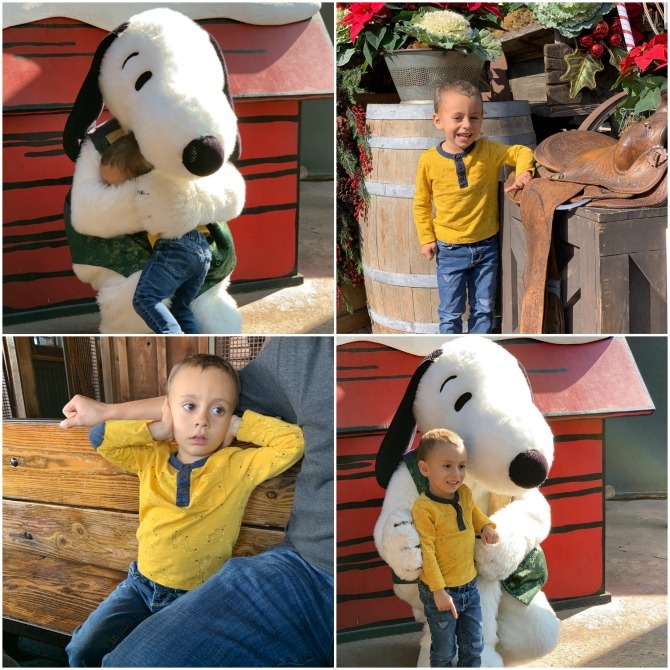 We spent most of our time in Camp Snoopy, which is geared toward younger kids. Unfortunately, Camp Snoopy is surrounded by very loud roller coasters which was tough for my noise-sensitive kid to tolerate; he spent most of the day with his hands over his ears, anxious about when the next coaster would come by. But besides one big meltdown, he had a fantastic time. When it came to the rides, Charleston was pretty fearless and LOVED everything we went on (the Flying Ace planes and Woodstock’s Airmail were the biggest hits). In addition to riding rides, we had lunch at Panda Express (who knew they had that at Knott’s?!) and we all went to see a Snoopy on Ice show. The show was phenomenal, especially for a free show inside an amusement park; our favorite part was when Linus read the Christmas story from the Bible and the entire audience began to cheer—I literally had tears in my eyes, and for a few moments my hope in humanity was restored. Charleston also got to meet Snoopy, which he loved. Despite the noises and not getting a nap, we lasted well past dark and may have stayed longer if we weren’t so cold—I’d call that a success! 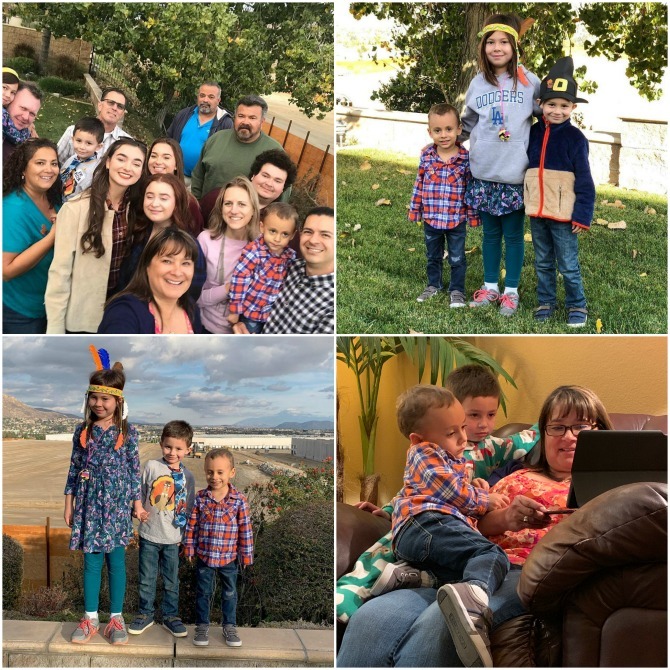 We celebrated our Dix Family Thanksgiving with my parents, brother, and grandmother on the day before Thanksgiving. My mom prepared a delicious meal (with gluten free stuffing just for me, thanks Mom!) 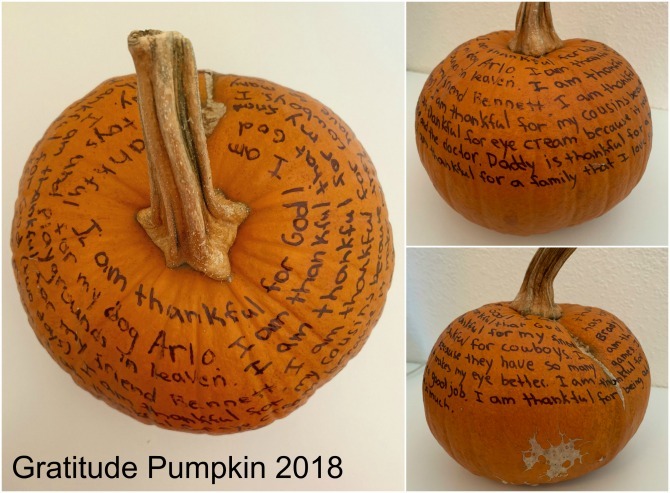 and we reflected on Thanksgiving memories, recorded what we were thankful for in our Thanksgiving journal, and watched (surprisingly entertaining) YouTube videos of the small town in Germany where my grandmother grew up. My Oma will be 94 in January, and it is such a blessing that we are still able to celebrate these moments with her. Her memory is fading, but this Thanksgiving I enjoyed listening to her stories about growing up in Germany, coming to the United States after WWII, and her biggest blessing after arriving in the States: the birth of her surprise third child (my mom!). It was also so heartwarming to watch her read stories with Charleston. 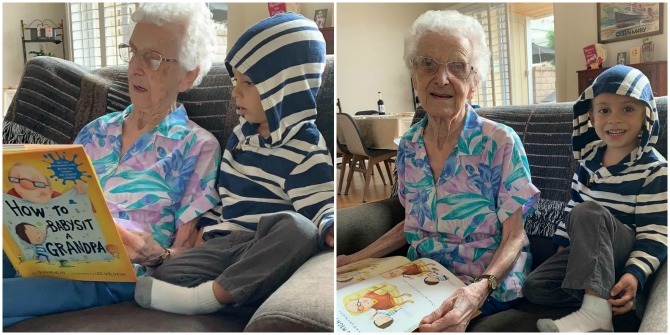 They made a great team: he can’t read the words yet but she’s got that down; and she has trouble staying on track, so he helped her turn the pages in order. It was so precious to see them united in the sharing of a simple story. 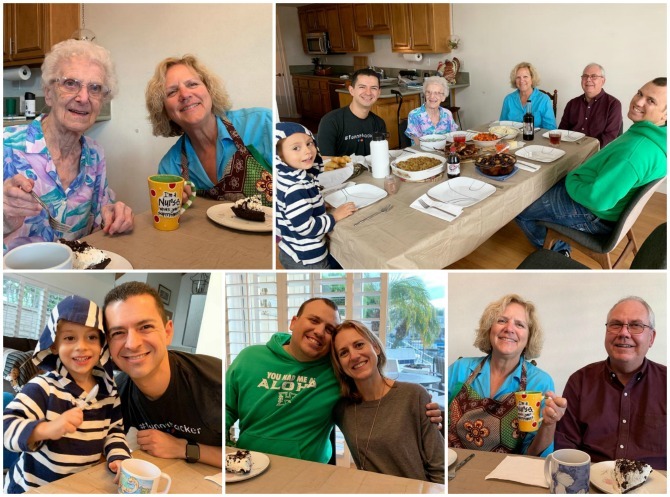 We spent Thanksgiving Day with Luke’s extended family at his tía Es’s house in Riverside. Not everyone made it this year, but it was wonderful to reconnect with everyone who was there. Charleston had a blast with “his” (actually Luke’s) cousins Aubrey and Landon! Es made a fun scavenger hunt for the kids and they rocked it, and at the end of the evening they enjoyed doing some Christmas shopping with Es on her ipad. 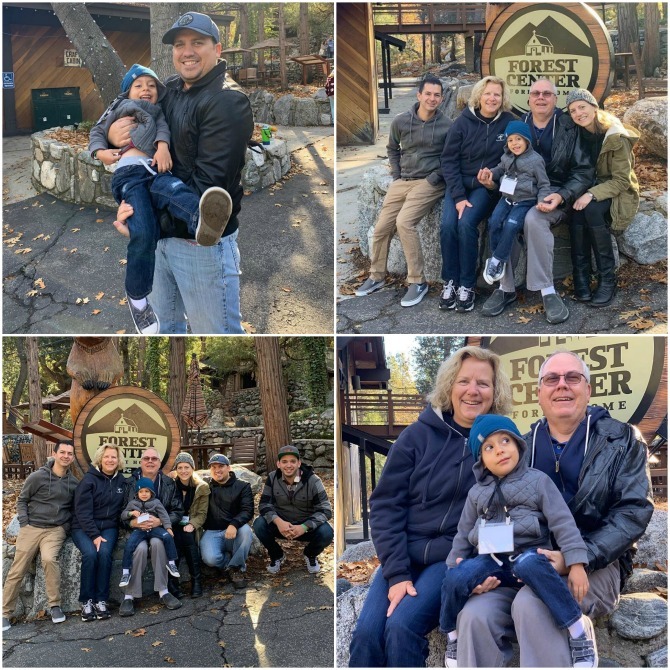 We ended our time in California with one of my very favorite family traditions: Home for the Holidays family camp at Forest Home Christian Camp in the San Bernadino mountains. I’ve been going to this camp since I was a child, and it holds such a special place in my heart. The camp grounds are gorgeous, and it’s been great to see all of the improvements they’ve made to the campgrounds. We stayed in a great cabin this year, and Charleston especially loved playing on the bunkbeds in our room. The weekend at family camp is pretty structured. We ate all of our meals (which were delicious) in the dining hall as a family. In the mornings, Charleston attended a kids program with other preschoolers, and at night a babysitter came to our cabin to hang out with him. While Charleston was having his own fun, we adults attended worship and teaching sessions. These are always good, but this year’s teaching from Jason Carson (one of the founding members of the OC Supertones) was especially phenomenal. I loved that we had the chance to be spiritually fed, knowing that Charleston was in good hands. 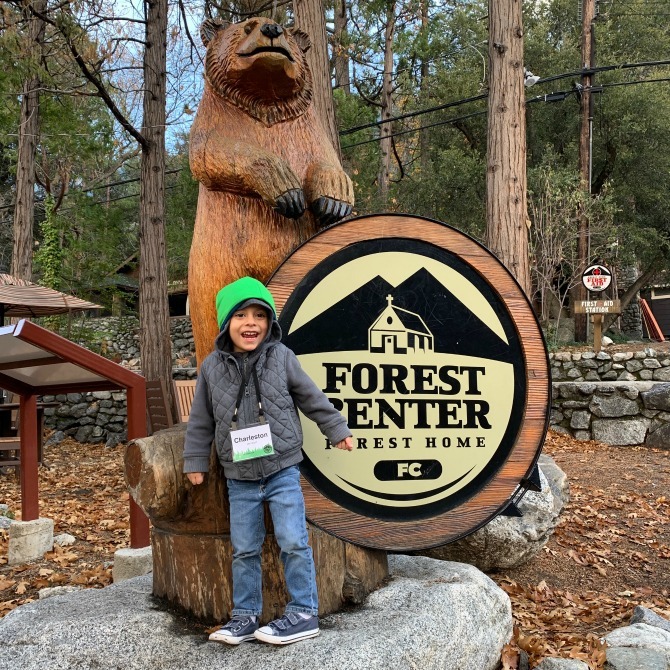 There were a few camp-wide activities during the weekend: we made a pine-themed Christmas ornament, attended a tree lighting and caroling, and decorated gingerbread cookies. 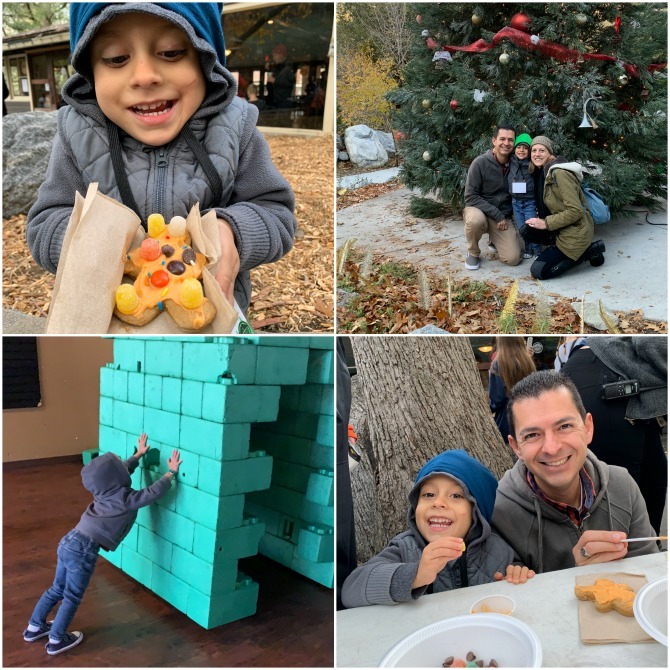 Other activities that we didn’t make it to this year included a living nativity, a family service project, and s’mores around a campfire. We also had plenty of free time at camp and spent it hanging out in the coffee shop, playing Jenga and building with blocks in the game room, and hiking. 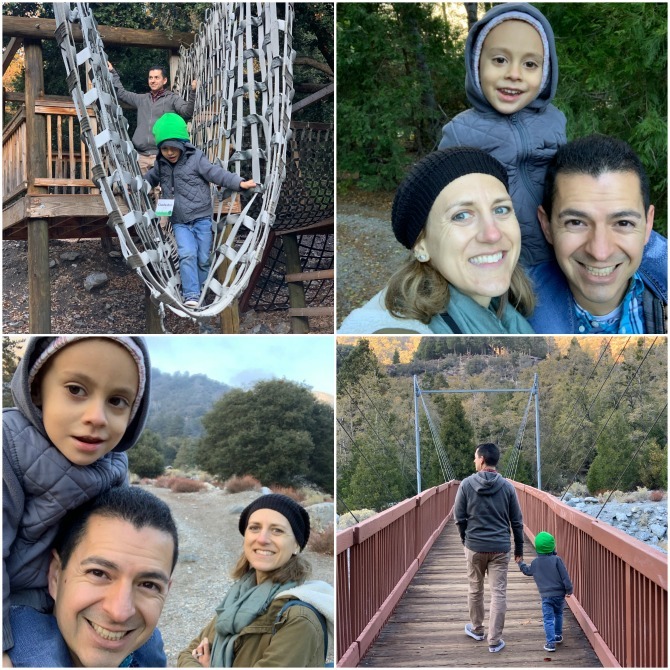 The mountains are my favorite place, and the spot where I feel closest to God, so I relished the time in the woods with my family. Charleston did really well with our hikes and loved getting to play on the ropes course. On the last morning of camp, they brought the kids in to perform some songs on stage. This was Charleston’s first-ever performance and it didn’t exactly go well: I could tell he was teary from the moment he got on stage. Once the singing started, he sat down and sulked, and then he saw me in the audience and it was game over: he came rushing toward me and refused to go back on stage. 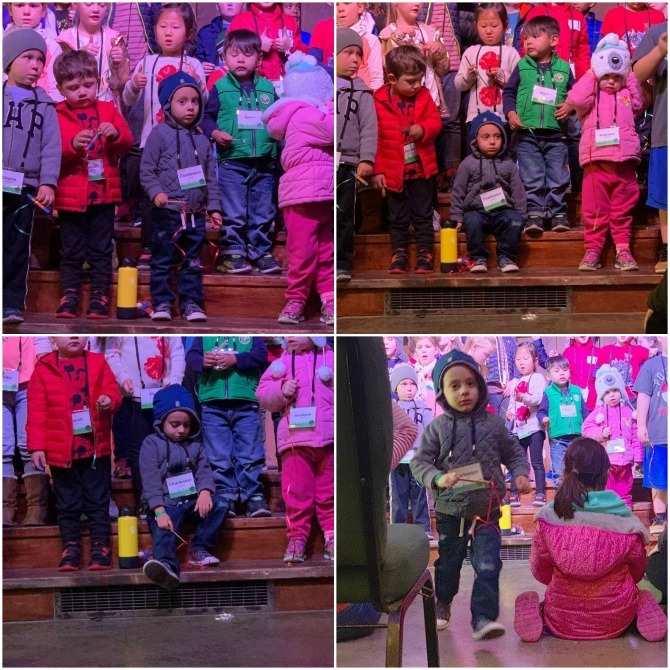 Amazingly, every other kid did great, so I’m not quite sure what was up with our guy; all I can say is that his performing career can only go up from here (and I’ll for sure be holding onto these pictures so we can look back and laugh when he becomes a big-time performer, haha!). The best part of family camp is that it takes place the weekend after Thanksgiving: when most people were trolling the mall for Black Friday deals, or rushing around to get their houses decorated for Christmas, we were literally getting away from it all in a place that doesn’t even have cell reception. I can’t think of a better way to prepare our hearts and minds for the Christmas season. 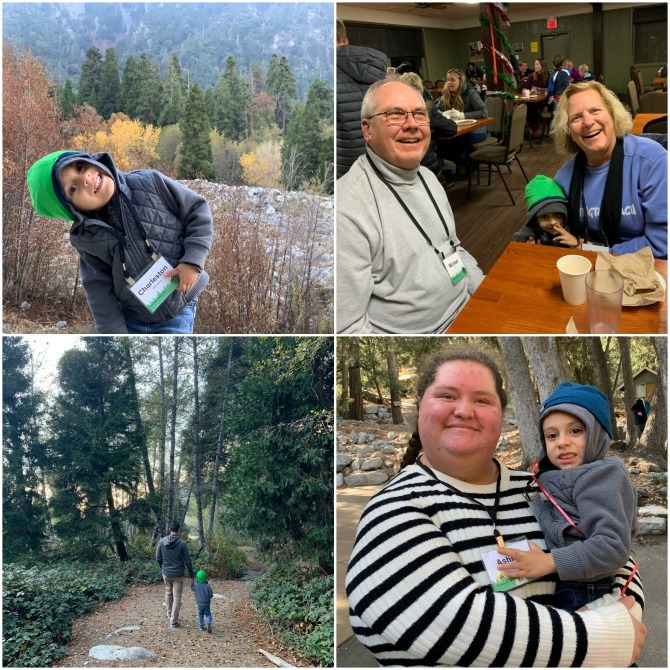 And getting to spend the weekend with my parents and Austin (as well as my parents’ friends Bob and Jennifer, and Austin’s room mate John) was icing on the cake of a perfect camp weekend. What a great month it’s been, and I know December will be just as wonderful! What was a highlight of your November?